Check out this is a short video on bonds produced by Investopedia! Investors recieve a bond in exchange for money which serves as a loan to the bond issuer. When the bond matures, you will receive the face value of that bond. The face value is what you initally paid for the bond. The interest of a bond is known as the coupon. The investor is promised to recieve the full par at the maturity date with regular interest payments. This week’s “pin” features stocks. We have compiled a list of basic stock fundamentals with links to further explain the material provided. 1) Sectors. Sectors are a way of categorizing and classifying stocks. They are typically classified by type of business or industry. The fastest growing sectors are currently the health and technology industries, although that varies often. 2) Growth vs. Value. Growth stocks are just as they sound: they are anticipated to grow at an above-average rate. Value stocks, on the other hand, are viewed as bargains in the sense that the market has undervalued the stock and the investor hopes to get in before the market corrects the price. 3) Company size (“capitalization”). A company’s size is measured by its market capitalization. Large-cap companies are typically established with a lower growth prospective than small cap. Small-cap companies tend to have higher growth potential in the long run, but investors may see more volatility with small-cap stocks since small companies have a higher likelihood of running into trouble as they expand. 4) Risk. The possibility of a stock performing worse than expected. There are many types of risk that an investor must consider, such as market risk, political risk, business risk, and others. Typically, the larger the risk, the larger the possibility for return. The best way to minimize your risk is to properly diversify your portfolio. 5) Taxation. Your income and capital gains are taxed unless the stocks are held in certain types of retirement accounts. Some investment strategies can reduce tax liability, but as with all other investment considerations, this must be done with care and prudence. 6) Trade fees. These fees are imposed when stock is bought or sold. Some brokers will label this fee as a “transaction fee.” Trade fees can range in price, so be sure to research a broker’s fees before making transactions. 7) Cyclical vs. Defensive. Cyclical stocks are sensitive to the economic cycle. In tight economic times, people are less likely to spend money on unnecessary items, such as retail and entertainment, which can impact cyclical stock prices. Defensive stocks include necessary items, such as food and medicine. For this reason, defensive stocks tend to change very little when the economy declines. 8) Selecting stocks. The first step in selecting a stock to purchase is to determine your objective and risk tolerance. You must also remember the importance of diversification, as investing in a single company is much riskier than investing in, say, eight or ten companies. The more you know about a company and about the current market, the better. You can also narrow your search for stocks using a stock screening tool. 10) Stocks vs. Mutual Funds. Mutual funds are used to diversify a portfolio better than individual stocks allow. Each mutual fund contains holdings of several different individual securities, allowing an investor to easily spread his or her investment dollars among several companies instead of just one. Another advantage of mutual funds over stocks is that each fund has a professional manager of its own, who buys and sells securities within the fund so the individual investor doesn’t have to. Every investor is different, so individual circumstances must be fully considered when constructing a portfolio. Don’t forget to check out our boards on Pinterest! This is a fun educational video by Investopedia. Stay tuned for next week's featured pin blog post with more on the basics of stock investing. 1. You must consider transaction costs. “Discount brokers” charge $9-20 per trade, but full service brokerage trades can run to hundreds of dollars per trade. Bonds are often traded on a hidden “mark-up” basis that can easily be $100-$300 per bond. 2. Annual account fees. These are administrative fees some custodial companies charge on accounts each year. 3. Front-end vs. Back-end load. It is just like it sounds; front-end charges a fee up front when you make a purchase and back-end charges a fee when you sell a particular fund. Be sure to watch for loads when buying and selling securities. 4. Expense Ratio. This is what a portfolio manager charges to manage a mutual fund. The expense ratio is represented as a percentage, which is deducted from your returns. The lower the expense ratio, the higher percentage of return you keep in your pocket. This is usually an ongoing fee in addition to front- or back-end loads. 5. Investment Management Fees. A fee charged as a percentage of the total assets being managed for discretionary accounts, where a manager makes decisions on behalf of the client. 6. Administrative fees. These fees are included in the expense ratio of a mutual fund. They cover the costs of maintaining the customer service line, mailing, record-keeping for the fund, and so on. 7. 12 b-1 Distribution. This fee can range from 0.25%-1.0%. It covers the cost of advertising and distribution. This fee is built into the expense ratio of a mutual fund. 8. Commission-based vs. Fee- Only- Commission-based agents are limited to only what they have available to offer, which could fall short in offerings in their clients’ best interests. The commissions are an added expense in the product. Put simply, commission-based brokers often offer a narrower range of products with higher expenses. 9. Family Investment Center works to find stellar managers while keeping expense ratios as low as possible. Utilizing Morningstar® research software to explore a large universe of investments, we are able to choose those that are in our clients’ best interests without judgment being clouded by commissions or trade fees. 10. At Family Investment Center, our only compensation is an annual management fee, which is a small percentage of assets under management. We do not receive compensation based on sales. Period. CNN Money presented an interesting article on high school personal finance education. The Center for Financial Literacy at Champlain College has reviewed all 50 states and graded them. Eleven states recieved an F, where personal finance is not a requirement for students and may not even be offered. Missouri is one of seven states to pass with an A. Missouri requires students to enroll in a minimum of one semester to learning about personal finance. It is an extremely important topic for students to learn about. 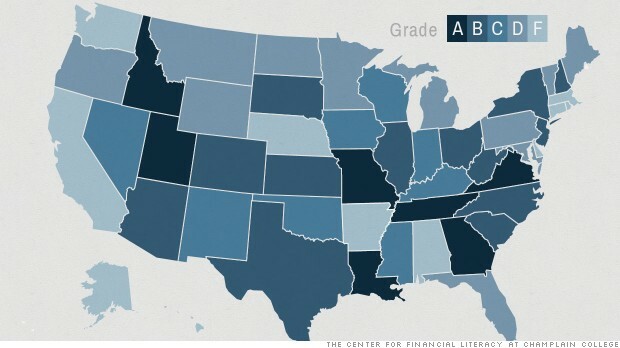 Only 40% of states recieved an A or B when graded on personal finance education. To learn more about how states were graded and how other states performed, please click here. 1. Everyone should do it. Budgets are needed at all different income levels. Tracking how much you spend helps you make more informed decisions. 2. Know what triggers your spending. When you recognize what is causing you to spend more money, it is easier for you to stop. 3. You can still have fun. Just because you are being careful with your money does not mean you can’t have fun! Just make sure you’re allocating only as much as your budget allows. 4. Stop sales emails from stores. It is much easier to avoid spending money on handbags when you don’t get the emails announcing their 10% discount. 5. You spend more money on grocery shopping when you are hungry. Eat a snack before you shop! 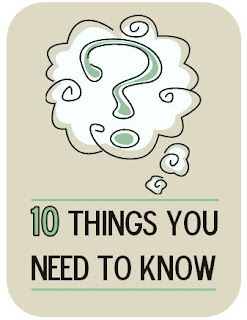 6. Review your bills before paying­­. Make sure you know what you’re paying for. Make sure they don’t sneak in things you’re unaware of. 7. Expect the unexpected. It’s necessary to allow cushion in your budget to pay for unexpected expenses. An emergency fund is crucial! Aim for enough to take care of 3 to 6 months of expenses. 8. If you fall off track one month, get back on the next. If you spend more than budgeted one month, don’t get discouraged and give up. Spend less the next month or reevaluate your budget allowances. Make necessary adjustments and don’t give up! 9. Helping yourself will help your children. Your children learn by watching you. Help instill good spending habits in your children. 10. Really think about big purchases before you make them. Don’t rush into anything! This will also help to prevent buyer’s remorse when you get home. Stay tuned for next week’s pin! Also, check out our boards on Pinterest! We are very excited to inform you about the launching of our new Pinterest account! 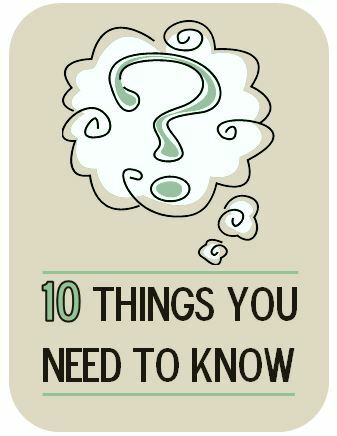 Each Monday through the month of July, The Family Investment Center will be blogging “Ten Things You Need to Know About…” Each post will be featured on our Pinterest. We encourage you to follow us on Pinterest and check out our boards! 1. We have been serving clients since 1998. We use proven strategies and quality investments to best meet the needs of our clients. Family Investment Center had their 15 year anniversary on June 1st. 2. We serve clients like you. Family Investment Center was built from the ground up to serve families similar to yours. 3. We manage over 100 million dollars in client assets. 4. We operate in a commission-free environment. We do not earn commissions for selling certain products. We are fee-only, meaning we charge only a small percentage of each client’s assets annually. 5. We have a broad selection of products to choose from. Commissions typically limit the products that are available to clients to the products that provide commissions to the broker. Fee-only advisors aren’t tied to a certain group of products since we don’t depend on commissions. 6. We enjoy economies of scale. Our clients benefit from volume pricing on investments, which means lower costs across the board for our client families. When you lower cost, you increase your net investment return. 7. Each investment portfolio has a dedicated team working on the individual portfolio. Our team brings “group think” in a very positive way to ensure the best practices are being utilized. 8. We have had numerous media mentions. We are proud to have such a strong presence in the St. Joseph Community and beyond. We have been mentioned in publications such as The Wall Street Journal, The New York Times, BusinessWeek, Kiplinger, Medical Economics, and many others. To view our media mentions, please click here. 9. We use social media to educate and connect. Check out our website at www.familyinvestmentcenter.com and our blog at www.familyinvestmentcenter.blogspot.com. You can also find us on Facebook at Dan Danford and Family Investment Center, on Twitter at family_finances, and on Pinterest at Dan Danford Family Investment Center! 10. We serve clients in 13 states from one office in St. Joseph, Missouri. We have fine-tuned our processes to allow us to efficiently serve folks all over the nation from one office. This allows us to keep overhead costs down, which in turn means we can keep our management fees low. Stay tuned for the next featured pin!